We are excited to announce that we have been successful in winning this year's Master Builders Association Award for Best Renovation / Addition under $200,000. Award winning Wangaratta builders, Sam Lindsey Constructions, build quality, affordable homes, renovations and extensions. Our team of dedicated and highly skilled craftsmen provide innovative, eco friendly solutions for a range of new homes and existing home building projects. Built on a foundation of quality, integrity and commitment to exceptional service, Sam Lindsey Constructions prides itself on always meeting client expectations. We specialise in new homes, extensions, renovations and custom homes built to client specifications. We have experience working on period homes and modern homes, and we offer assistance at every stage of the project. We also provide a specialist commercial service for shop & office fit outs. 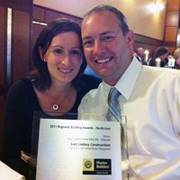 Sam Lindsey Constructions is an award winning builder. Our dedication to quality craftsmanship and innovative eco-friendly solutions were rewarded with a 2011 Master Builder award for Best Custom Home $400,000-$500,000 and again in 2013 for Best Renovation under $200,000.